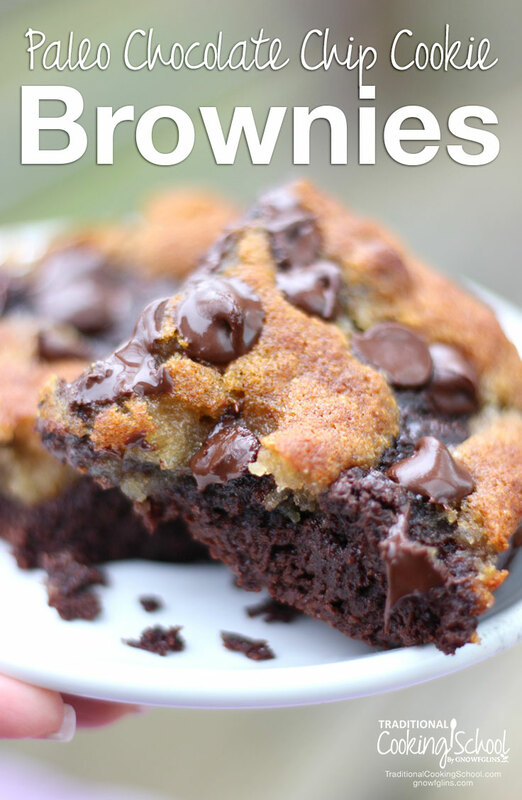 To create a whole food, Paleo version of Chocolate Chip Cookie Brownies! And a cookie lover’s dream. When you see this double-decker pairing, I promise it'll be hard not to grab all of the ingredients and get baking! With coconut flour, avocados, coconut oil, and collagen, this recipe is both delicious and wholesome. Coconut flour is grain-free, high in fiber, and affordable, while avocados are a great source of healthy fats — and help keep this treat moist! And have you tried coconut syrup yet? It's a wonderful whole food sweetener made from the sap of the coconut tree (similar to maple syrup)! I like using it in cookies and brownies because it tastes mildly of caramel and brown sugar. This recipe will serve a crowd. So, make these Paleo Chocolate Chip Cookie Brownies for a party or a potluck… or for your own family with plenty of leftovers to enjoy after! 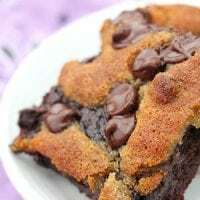 These whole food, Paleo Chocolate Chip Cookie Brownies are a dream come true for brownie lovers and cookie lovers alike! Makes 15. Grease a 9" by 13” casserole dish or pan. Combine liquid ingredients in a blender: eggs, avocado flesh, coconut syrup, coconut oil, and vanilla extract. Blend for 30 to 35 seconds, stopping once to scrape down the sides of the blender container. Set aside. Sift cocoa and baking soda into large mixing bowl. Add remaining dry ingredients: coconut sugar, coconut flour, collagen, and sea salt. Use a whisk to mix them together thoroughly. Pour wet ingredients onto dry ingredients. Fold with a rubber spatula until completely mixed. Pour into greased dish, spreading batter evenly to the edges. Set aside to make the chocolate chip cookie batter. In a medium-sized mixing bowl, combine the dry ingredients: coconut flour, coconut sugar, sifted baking soda, and sea salt. In a small bowl, whisk together the wet ingredients: eggs, coconut syrup, coconut oil, and vanilla extract. Add the wet ingredients to the dry ingredients. Mix well. Add 1/2 cup chocolate chips. Stir in briefly. Now, use 2 spoons to create about 15 divots in the brownie batter -- about 3 to 4 divots in each row latitudinally. This is so the cookie batter can sink below the surface in places. Use a 1-ounce cookie scoop (or 2 spoons) to place dollops of cookie batter in the divots over the surface of the brownie batter. Sprinkle remaining 1/4 cup chocolate chips over the entire surface of the cookie and brownie batters. Place casserole dish into preheated oven. Bake 25 to 35 minutes, checking for doneness around 25 minutes. When done, the batter should be puffed all over, the edges starting to come away from the sides of the pan. The center will be mostly set and the cookie batter golden brown. Allow to cool, and then cut into squares. Enjoy! Are you so excited to make these Paleo chocolate chip cookie brownies?! Ooooh! I can’t wait to try this but I currently don’t have coconut syrup on hand. Is there something I could sub for it? Maple syrup? Thanks! Would brown rice syrup be a good substitute for the coconut syrup? I have everything but the collagen; can I leave it out or would it ruin it? Thank you! Looks yummy! Hi Genevieve. The collagen affects not only the protein content of the brownies, but also the texture. However, I don’t think they’ll be ruined without…you just won’t get the same outcome. Could you use gelatin instead? Is there a difference between collagen and collagen peptides? I have the later. I’m doing THM. Is there a way to use Stevia or Swerve for the liquid sweeteners in these recipes? Hi Vickie, I’ve found over the years that a good brownie texture (unfortunately) is largely created with a larger volume of sweetener. If you choose a sweetener alternative, it should measure the same quantity as the coconut syrup, or the texture will be affected. That said, I spent many years only using stevia as my preferred sweetener, and you may not mind the texture changing. I haven’t tried the substitution myself, so I can’t vouch for the outcome. But I’d love a follow-up comment from you if you try it. Perhaps they will be more cakey and less gooey, if I had to guess. I have not worked with Swerve, so I can’t comment on that one specifically. I made these Sunday and they were wonderful. The pan was gone in 24 hours for my family of 6. I didn’t have coconut syrup so I used maple syrup instead. I found the avocado made them super moist and I really like that; sometimes coconut flour baked goods are a bit dry. Hi Audrey, there are ways to sub for eggs using gelatin, flax or chia seeds, but just know that I haven’t made these variations with this recipe, so I can’t vouch for the end result. My youngest is egg-free, and it can be challenging, but worth it! Blessings! We made these 2 nights ago as a bedtime snack, and they were DELICIOUS! I had to bake them about twice as long as the recipe says, so not sure what’s going on there. I loved the texture, and they weren’t too sweet! Thank you for a great recipe! Hi, any plant version of collagen? I’m vegetarian going to vegan. I know I can use substitute the eggs by flaxseed or chia seed. Hi Sarah, there isn’t a direct sub for the collagen. Also, if you sub the eggs, your end baked good will be a little bit different. Pulling out or subbing for the collagen will make it even more different. They might still turn out yummy, but too many substitutions won’t yield the same finished result. Hi Megan, understood there’s always no direct sub. I will try skipping the collagen that acknowledged different texture will be resulted. Thanks for your sharing! Is it possible to make only the brownie portion? How do you think that will affect the baking time? Soooo excited about this recipe! ? Would gelatin have the same effect as collagen for these brownies? Meaning if I substitute gelatin as we don’t have collagen? Hi Selma, no, unfortunately. Gelatin and collagen have different roles in recipes. Best wishes.